Objective: To investigate differentially expressed proteins in rat mandibular condylar cartilage (MCC) chondrocytes caused by initial mastication for short postnatal periods. Methods: Four groups of protein samples were extracted from primary cultured rat MCC chondrocytes, harvested from eigthy postnatal SD rats aged 1,7,14 and 28 days, with twenty in each group. Total proteins were labelled with isobaric tags for relative and absolute quantification (iTRAQ) reagents. Two-dimensional nano-high-performance liquid chromatography (HPLC) and matrix-assisted laser desorption ionization-time-of-flight/ time-of-flight (MALDI-TOF/TOF) mass spectrometry analysis with iTRAQ technique were performed. All data were analysed by MASCOT software with the SWISSPROT protein database. Furthermore, bioinformatics and statistical analysis were performed to classify their cellular components, biological processes, molecular functions and metabolic pathway by the PANTHER database. Results: In total, 137 differentially expressed proteins were identified during MCC growth and were assigned to one or more cellular components. According to the PANTHER analysis, a significant proportion of proteins are involved in the metabolic process, cellular process, biological regulation, developmental process and response to stimulus. The most extensive molecular function was 43% in catalytic activity. In addition, it was found that proteins in MCC chondrocytes change markedly on the growth stage of eruption of the teeth. Conclusion: This study provides an integrated perspective of molecular mechanisms regulating early normal postnatal growth and development of rat MCC at the protein level. Objective: To evaluate the reproducibility of four parameters for quantitatively assessing maxillary molar furcation involvement (FI) by cone beam computed tomography (CBCT). 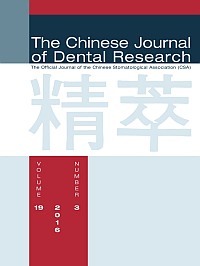 Methods: Thirty-nine sites with degree II FI, classified by probing of 21 maxillary molars, were investigated. Degrees of FI in these sites were assessed based on CBCT data. In these samples, four parameters for quantitatively assessing FI in CBCT images were measured. The parameters included horizontal bone loss at furcation entrance level (HBL), maximum HBL (HBL-max), maximum vertical bone loss (VBL-max) and root trunk length (RT). The reproducibility of the measurements was evaluated. Results: Amongst the 39 degree II FI classified by probing, only 17.9% were confirmed by CBCT. The other 46.2% were 'through and through' defects, 15.4% were fused roots and 20.5% were degree I FI in the CBCT image. The intraobserver repeatability for all four parameters was high, with intraclass correlation coefficients (ICC) of 0.960 for HBL, 0.992 for HBL-max, 0.987 for VBL-max and 0.983 for RT. The ICCs for two observers was also high (ICCs: 0.873 to 0.947). The parameters and related methods of measurements proposed in the study showed high reproducibility. CBCT images provided more details in assessing maxillary molar FI. Conclusion: The parameters and related methods of measurements developed in this study showed high reproducibility. CBCT images provide more details in assessing maxillary molar FI. Objective: To evaluate the potential of omega-3 polyunsaturated fatty acid supplement as an effective, safe and inexpensive medicine for the treatment of recurrent aphthous stomatitis. Methods: In this double-blind clinical trial, 50 patients with recurrent aphthous stomatitis were randomly divided into the omega-3 group and placebo group. Patients in the omega-3 group received 1000 mg omega-3 group capsules (Daroupakhsh Company, Tehran, Iran) for 6 months; while those in the placebo group received placebo capsules with the same instructions. The pain, size, duration and recurrence rate of ulcers were recorded in each follow-up phase. Follow-up was done weekly in the first month of drug prescriptions and then monthly in the next 5 months. The data were analysed with SPSS-20 through the Mann-Whitney test to compare the groups with respect to each variable and the Wilcoxon and Friedman tests to compare the groups over time. Values were significant at P < 0.05. Results: In the omega-3 group, pain was lessened from 4.96 to 3.04, irritation was reduced from 5.88 to 4.00 (P = 0.0627) and the size of ulcers was decreased from 2.30 to 1.48 mm (P = 0.062). No significant change was observed in the aforementioned variables in the placebo group. Moreover, the number of ulcers indicated a significant reduction in the fourth, fifth and sixth months in comparison with the placebo group (P = 0.00). Conclusion: The recurrence of ulcers in the omega-3 group showed a significant decrease in the fifth and sixth months compared with the placebo group (P < 0.05). The current study indicated that omega-3 consumption decreased the symptoms of recurrent aphthous stomatitis. The present report describes myofunctional therapy using a ready-made training device, the T4A, in patients with permanent dentition and its effect on the prevention of relapse. The buccinator mechanism maintains the inner pressure of the tongue muscle equivalent to the outer pressure of the perioral soft tissues, such as the orbicular muscles, including the cephalopharyngeus and buccinator muscles. Training is performed so that patients learn to place their tongue and lips in the appropriate resting positions. The shape of the T4A and tongue guard supports the tongue from the bottom, allowing formation of the correct resting tongue position. However, the use of T4A for a long period of time may cause the teeth movement; therefore, caution is required. Use of the T4A is effective for the correction of oral habits, myofunctional therapy and for teaching the correct resting tongue position during the daytime and for the correction of oral habits, teaching correct resting tongue position during sleep. The separate distolingual (DL) roots of three-rooted mandibular first molars are thought to be too difficult for performing apical surgery. This article represents microsurgical treatment of a three-rooted mandibular first molar with a separate DL root. The procedure includes incision and flap retraction, osteotomy, apicoectomy, retropreparation and retrofilling of the root canal, using micro instruments, ultrasonic retrotips and mineral trioxide aggregate (MTA) under a dental operating microscope. Two mm in length of apical root resection, 2 mm in depth of root canal retropreparation with a personalised ultrasonic retrotip, and 2 mm in length of retrofilling with MTA are the key points for accomplishment of apical surgery on separate DL roots. The case was followed up for 15 months after surgery. Clinical and radiographic examinations revealed complete healing of periapical tissue. Separate DL roots of three-rooted mandibular first molars can be treated by endodontic microsurgery with modifications from standard protocol.